Vintech Pacific were pioneers of crossflow filtration technology for the New Zealand wine industry. Today, we are the acknowledged leaders in crossflow filtration as a service for New Zealand’s wine producers. The solid particles are too large to pass through the medium and are captured, while the filtrate liquid can pass and is collected, clean. Crossflow filtration differs from more traditional ‘dead-end’ filtration methods in several ways. Firstly, let’s look at the way those more traditional methods work. Generally, a feed-liquid containing solids in suspension is passed through a filtration medium. The solid particles are too large to pass through the medium and are captured, while the filtrate liquid can pass and is collected, clean. As this process continues, the medium can become clogged with solids and, even if pressure is increased, the procedure slows and becomes less efficient. Eventually, the operator must stop the process to clean or replace the filter medium. For this reason, these dead-end methods are ‘batch’ processes. Filtration media can be varied. Paper and wood cellulose are examples of plant-based media. Sand, diatomaceous earth, perlite and bentonite are animal or mineral-based. All involve the issue of disposal after use, which can be costly and environmentally fraught. In crossflow filtration on the other hand, the feed liquid flows tangentially across a semi-permeable membrane, not directly through it. 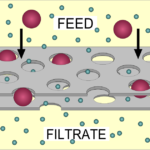 As the feed liquid passes over the surface of the membrane, just as with other media, the filtrate can pass through to be collected but the solids are excluded and remain on the feed side of the membrane. However, because the feed flows continually across the surface of the membrane, there is an element of self-cleaning and so, the membrane is less prone to clogging than with dead-end methods. This means that crossflow is more continual than a batch process. Even if clogging does occur, the system can quickly regain its efficiency if necessary, by performing a backwash or PDF (Process Flow Disruption), where the transmembrane pressure is set to zero by temporarily closing off the permeate outlet, which increases the attrition of the fouling layer, to dislodge particulate matter, after which, filtration can continue without requiring replacement and disposal of the filter medium. Environmental concerns over the safe disposal of filtration media are a thing of the past – as are the costs. In one step, crossflow filtration clarifies the wine and renders it microbiologically stable for bottling. What is more, crossflow filtration can be seamlessly combined with other pre-bottling technologies, such as STARS stabilisation and OXI-Out dissolved gas management to provide unprecedented production speed, a marked improvement in efficiency and all the associated reductions in cost. In this way, our customers’ wines can make it onto shelves in their markets around the world before those of their competitors. For more information on how crossflow filtration can work for you, please contact your Vintech Pacific regional office.